Ahead of Valentine’s Day in 2019, The One Love Foundation and TBWA\Chiat\Day NY have teamed up to launch the second instalment of #LoveBetter, an important campaign designed to encourage conversation on the differences between healthy and unhealthy relationships. This year’s campaign transforms the king of all Valentine’s treats – the box of chocolates – into a provocative educational experience on how to #LoveBetter. 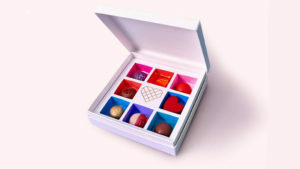 This special-edition box of chocolates, conceived, designed and developed by TBWA\Chiat\Day alongside a team master chocolatiers, contains eight custom confections created to spark conversations about positive and negative relationship experiences, all made from scratch. The pieces represent four healthy and four unhealthy relationship behaviours: Respect, Honesty, Equality, Independence, Sabotage, Obsession, Isolation and Manipulation. The box is accompanied by a piece-by-piece insert to explain more about each behaviour and its effects. For example, Respect is brought to life as a strong, dark chocolate decorated with gold saffron, representing the gold standard in a relationship; Manipulation is a chocolate filled with hard, sticky caramel that takes control of your jaw and is hard to swallow. For those who want to taste the chocolates for themselves, One Love is also running a contest to give away a limited number of the boxes to lucky winners. The special-edition One Love chocolates follows 2018’s successful SoHo pop-up gift shop that turned traditional Valentine’s Day gifts on their head to illustrate common unhealthy behaviours.